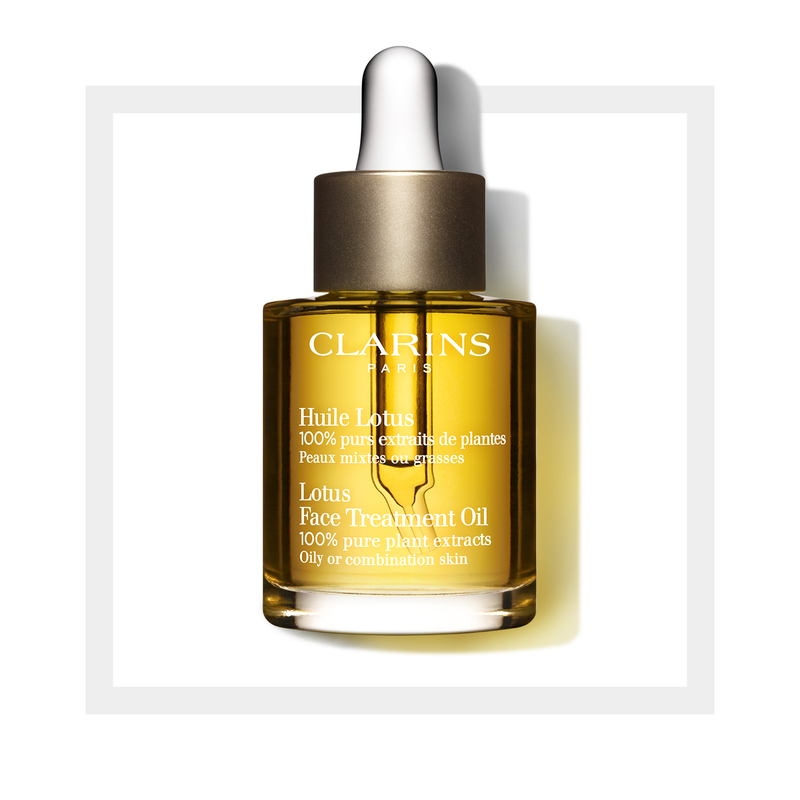 Clarins’ Lotus Face Treatment Oil is a perfect solution for oily or combination skin types. Its unique combination of 100% pure plant extracts including Rosewood, Geranium and Lotus works to perfect the skin surfaces and restore its balance. Its natural astringent effect works wonders in skin refinement and improves skin's overall texture. Hazelnut oil promotes suppleness and calms the skin. It also works to seal in moisture and keep your complexion looking its best. 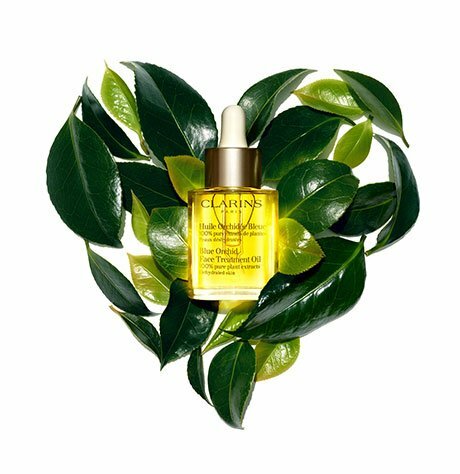 The anti-ageing properties of this face oil and its natural refinement qualities make it a great moisturizer for oily or combination skin. This oil is also non-staining, so it is safe against fabric. Rated 5 out of 5 by rachel87 from Can't do without this oil! I was living in Alberta 6 years ago and was having a lot of trouble with dry skin. A friend recommended I try this oil as everything else I put on my skin just didn't seem to give it the moisture and balance I desperately needed. Now, I use this oil every year during the winter months. It has helped my combination skin stay hydrated without any breakouts. I won't do without it and it's worth every penny. I use 2 drops nightly before my moisturizer. Love the smell of the product. Rated 5 out of 5 by vicprn from So wonderful I use a couple drops mixed with a face cream at night. It's so hydrating, smells wonderful, and leaves my face fresh. I never have a problem with blackheads or clogged pores. An absolute necessity in my night skin care regime. Rated 5 out of 5 by Hmoszczak from My must have for the last year I have used this Oil for the last year. I have combination skin with adult acne and large pores. This product has resulted in me not having to use Glycolic Acid treatment on my skin to control my acne and oil skin. Such a different concept, to use pure oil to treat oil skin, but it works. I use this product at night exclusively. I mix a few drops in my moisturizer in the morning under my makeup. I even use a drop of Lotus Oil in my foundation, it leaves my foundation radiant and with lasting results. A trick I learned from the Makeup Artist Wayne Goss. This product is a must in the winter months. The freezing Canadian winters leave my skin red with dry patches. Using a few drops at night and in the morning with my routine really help keep my skin calm. Rated 5 out of 5 by Sasa from I have used the lotus oil for 3 years and it is amazing! Rated 5 out of 5 by Nicky from I'm addicted Love the smell, love how it makes my skin feel. I put it everywhere even in my hair! Everyone needs this. I put it on my kids and myself if we get a but to much sun and it definitely helps the healing and hydrates our skin. I add a few drops to my regular body cream after I shave too.